It was my fate and fortune to be left alone in London on Bank Holiday. It was not an exciting day in London, believe me. Everyone that could get away got away, and the result from a London point of view was not cheering. The weather, too, as is now usual in England, was dull, grey, and dismal, with occasional glints of sunshine, perhaps four during the day. 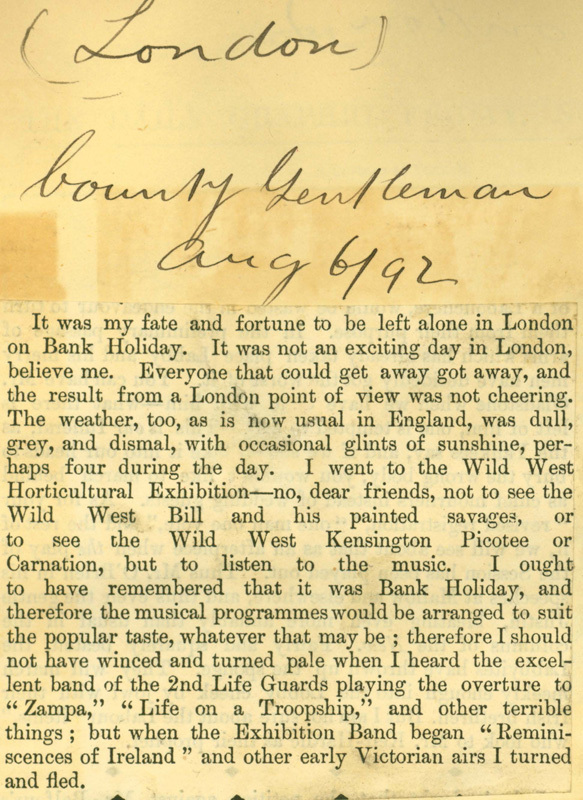 I went to the Wild West Horticultural Exhibition—no, dear friends, not to see the Wild West Bill and his painted savages, or to see the Wild West Kensington Picotee or Carnation, but to listen to the music. 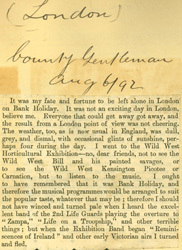 I ought to have remembered that it was Bank Holiday, and therefore the musical programmes would be arranged to suit the popular taste, whatever that may be; therefore I should not have winced and turned pale when I heard the excellent band of the 2nd Life Guards playing the overture to "Zampa," "Life on a Troopship," and other terrible things; but when the Exhibition Band began "Reminiscences of Ireland" and other early Victorian airs I turned and fled.